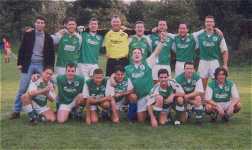 Back row, left to right - Leon Ashford, Russell Stinson, Andy Hardy, John Leslie, Mark Grice, Jim McPherson, R. S.
Front Row, Luca Pomaro, Lee Steer, Grant Ramsay, Adam Pomaro, Kevin Robertson, Tony Lawlor, Aidan McGettigan, Gerry Vavasour. 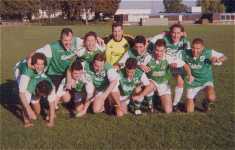 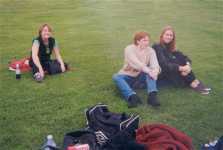 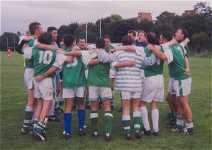 The London Hibs Team which beat Middlesborough 4-3 in the APFSCIL Cup on 10/10/99 celebrate with a huddle. 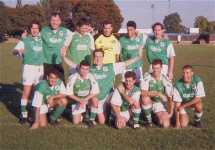 Back Row, left to right - Gerry Vavasour, John Leslie, Russell Stinson, Andy Hardy, Leon Ashford, Jim McPherson.